Saanich Remembers World War One is a project of Saanich Archives and the District of Saanich. Planning for the project began in 2012 with the assistance of community volunteers, Mary-Jane Shaw and Ray Travers. The project is a multi-year initiative that will continue through 2018. Like other communities in Canada, Saanich was deeply affected by World War One. Through military service, nursing, public fundraising and private support, residents of Saanich contributed to the country’s and community’s war efforts. Many families lost loved ones overseas, enduring profound grief and economic hardship long after the war ended. Saanich Archives is looking for your help to complete the municipality’s World War One Honour Roll and add to our records for 1914-1918. 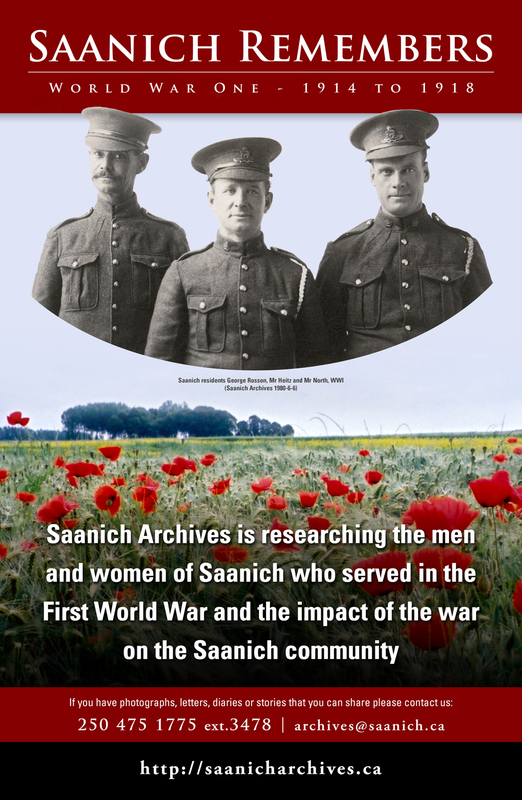 If you have documents, photographs, letters or diaries of Saanich residents who served in the First World War, please contact us by email at archives@saanich.ca or by phone at 250-475-1775 ext. 3478. The Saanich WWI Honour Roll lists 355 men and women from Saanich who served in the First World War but we believe there are many names missing. The goal of our project is to complete the Honour Roll and to learn more about each individual and the sacrifices they made.